Unlike an ambulance, a doctor car is an emergency vehicle that doctors ride to scenes where patients are in critical condition in order to diagnose and administer emergency medical treatment quickly. This actually raises the survival rate significantly. Tendo Ichika (Goriki Ayame) is an unmarried mother of a 5-year-old child and a new doctor of a general hospital�fs doctor car medical team. 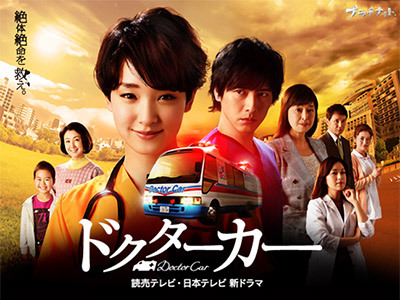 Asagi Yusuke (Nakamura Shunsuke), who is the only son of the hospital�fs director, thinks the doctor car is expensive junk and plots to get it scrapped. He is also unusually hostile to Ichika and the other members of the hospital follow him in picking on her endlessly.